Blogs, News, and Events / Blogs / What Makes a Visionary Learning Strategy? What Makes a Visionary Learning Strategy? SweetRush thought leaders share their experience working with learning and development organizations that have adopted a visionary learning strategy. The quintessential example of a visionary is Martin Luther King Jr., who led the fight for civil rights with strength and compassion. Visionaries like King have one thing in common—they all have a clear, long-range view of how things should be. True visionaries pair their vision with their ability to manipulate a medium or system to enact change or make something beautiful. Think of Mozart’s artistic vision paired with his innate understanding of the notes on a piano. At SweetRush, we’ve been privileged to partner with hundreds of highly successful organizations. We’ve worked with true visionaries, from CLOs to directors to program managers, who challenge the status quo and shape a new vision for learning in their organizations. We are always excited to push our craft to new heights by collaborating on and contributing to visionary learning strategies. 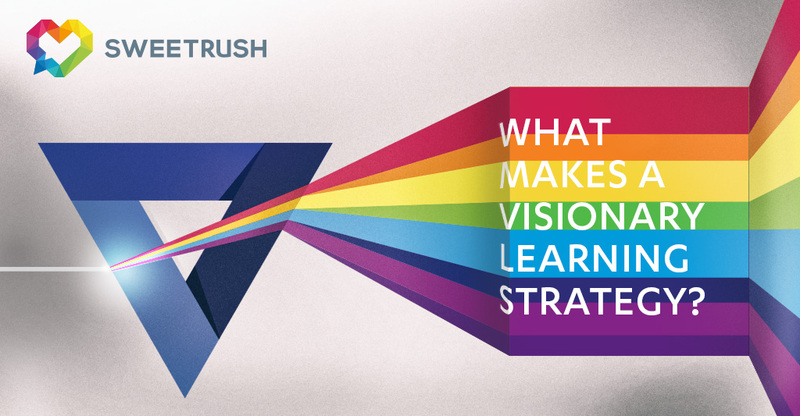 We asked some of our own visionaries at SweetRush about what it means to have a visionary learning strategy. We spoke with Lisa Van Damme and Annie Hodson, Solution Architects who work with our clients to analyze training needs and design effective learning solutions. We also spoke with Creative Director Annie Dickerson, whose role is to shape engaging artistic treatments for our learning solutions in alignment with our clients’ design standards. All three of our SweetRushians are quick to point out the ever-present tension between being visionary and being pragmatic. Vision requires innovation. It can be risky, and business constraints such as budget and time often suppress innovation. Lisa compares this tension to a bungee cord. “You’re trying to jump forward, but the tension increases the farther you go. A strong leader will try to get a little farther with each jump,” she says. You may get pulled back, but you should keep bouncing forward. And with the added momentum of others, you’ll gain some serious ground. From our Solution Architects’ feedback, it’s clear that a visionary learning strategy follows a pattern. It starts with a great deal of obscurity, but the solution eventually becomes clear. What we’re all striving for is a learning strategy that, while visionary, also yields real results. It affects the bottom line or results in measurable behavioral change. With a learning strategy, as with any investment (financial or otherwise), a risk-versus-reward struggle is at play, and sometimes more aggressive, less conventional solutions yield greater results. That sounds like a vision to strive for, doesn’t it? Want to read more about visionary learning strategies? Check out these posts from our SweetRush colleagues! Does Your Training Have Meaning? SweetRush thought leaders share their experience working with learning and development organizations that have adopted..